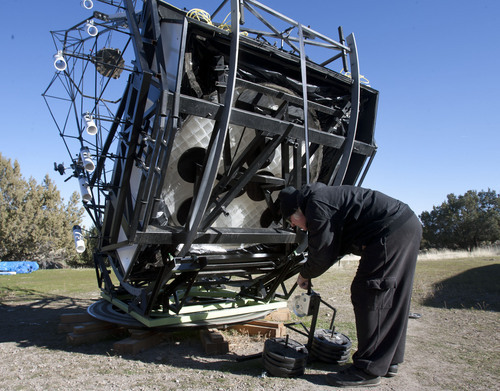 The 70-inch telescope stands 35 feet tall and was built with passion and dedication. Steve Griffin | The Salt Lake Tribune Mike Clements with his homemade 70-inch telescope in Herriman, Utah, Sunday, October 27, 2013. The 70-inch mirror and 35 foot length make it one of the biggest telescopes created by an amateur astronomer. 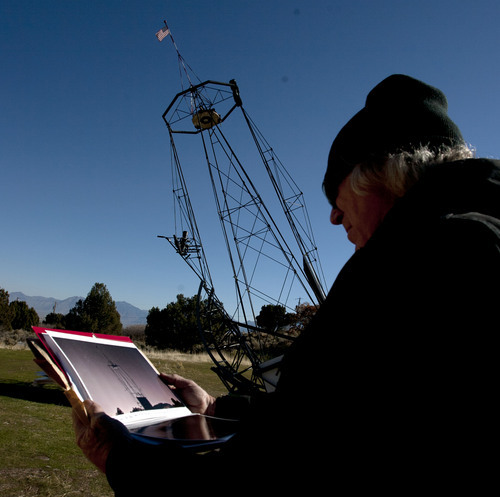 Steve Griffin | The Salt Lake Tribune Mike Clements with his homemade 70-inch telescope in Herriman, Utah Sunday, October 27, 2013. The 70-inch mirror and 35 foot length make it one of the biggest telescopes created by an amateur astronomer. Steve Griffin | The Salt Lake Tribune Mike Clements with his homemade 70-inch telescope in Herriman, Utah, Sunday, October 27, 2013. The 70-inch mirror and 35 foot length make it one of the biggest telescopes created by an amateur astronomer. Steve Griffin | The Salt Lake Tribune Mike Clements with his homemade 70-inch telescope in Herriman, Utah, Sunday, October 27, 2013. The 70-inch mirror and 35 foot length make it one of the biggest telescopes created by an amateur astronomer. Steve Griffin | The Salt Lake Tribune Mike Clements with his homemade 70-inch telescope in Herriman, Utah, Sunday, October 27, 2013. The 70-inch mirror and 35 foot length make it one of the biggest telescopes created by an amateur astronomer. 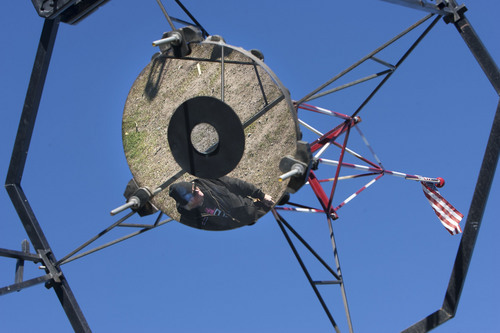 Steve Griffin | The Salt Lake Tribune Mike Clements is reflected in the secondary mirror of his homemade 70-inch telescope in Herriman, Utah, Sunday, October 27, 2013. The 70-inch mirror and 35 foot length make it one of the biggest telescopes created by an amateur astronomer. 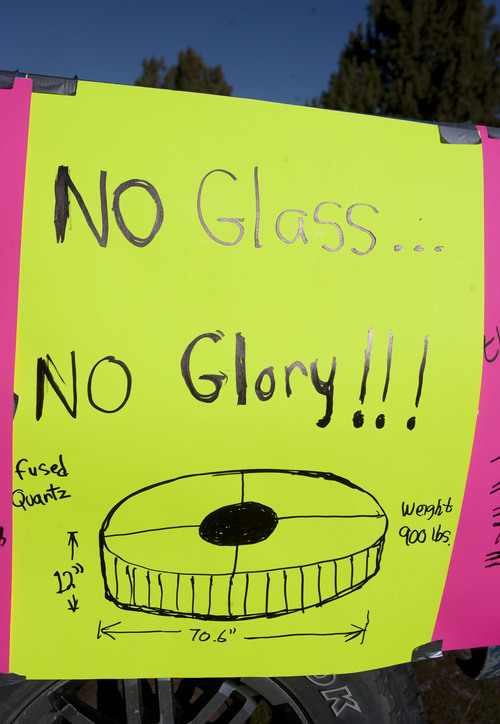 Steve Griffin | The Salt Lake Tribune A poster on his truck says it all when it comes to Mike Clements' homemade 70-inch telescope in Herriman, Utah Sunday, October 27, 2013. The 70-inch mirror and 35 foot length make it one of the biggest telescopes created by an amateur astronomer. Steve Griffin | The Salt Lake Tribune Mike Clements with his homemade 70-inch telescope in Herriman, Utah, Sunday, October 27, 2013. The 70-inch mirror and 35 foot length make it one of the biggest telescopes created by an amateur astronomer. Steve Griffin | The Salt Lake Tribune Mike Clements with his homemade 70-inch telescope in Herriman, Utah, Sunday, October 27, 2013. The 70-inch mirror and 35 foot length make it one of the biggest telescopes created by an amateur astronomer. Steve Griffin | The Salt Lake Tribune Mike Clements with his homemade 70-inch telescope in Herriman, Utah, Sunday, October 27, 2013. 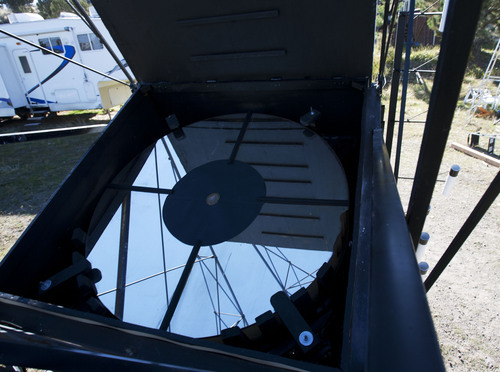 The 70-inch mirror and 35 foot length make it one of the biggest telescopes created by an amateur astronomer. 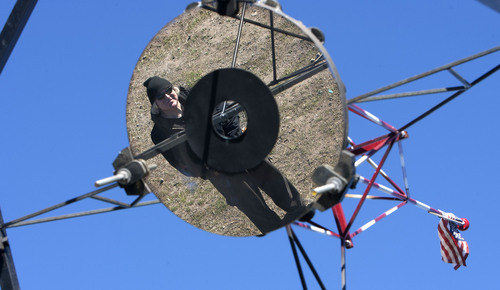 Steve Griffin | The Salt Lake Tribune Mike Clements is reflected in the secondary mirror of his homemade 70-inch telescope in Herriman, Utah, Sunday, October 27, 2013. 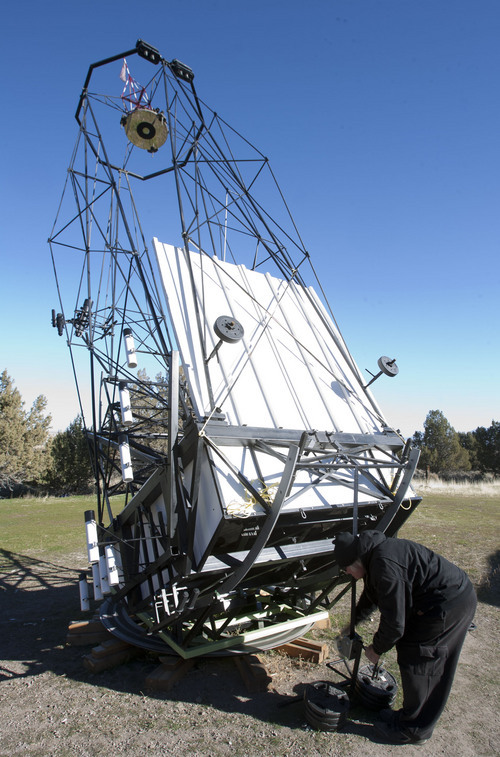 The 70-inch mirror and 35 foot length make it one of the biggest telescopes created by an amateur astronomer. 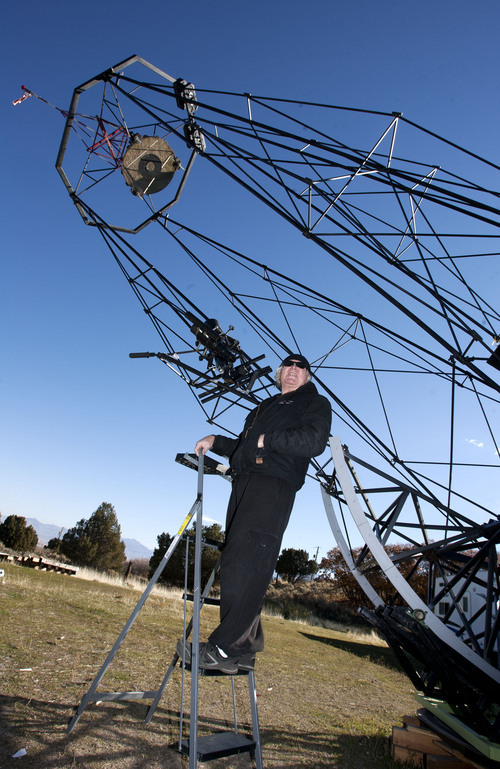 Herriman • Mike Clements has taken a lifelong passion and turned it into a record-setting astronomical achievement. 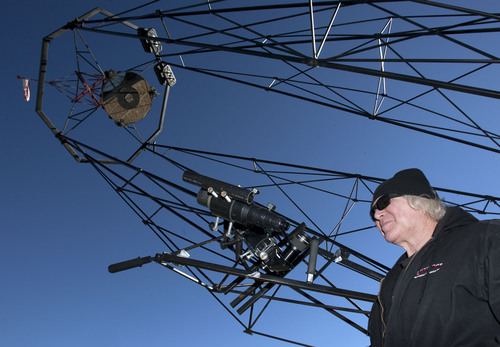 The long-haul trucker from West Jordan has single-handedly built a 70-inch telescope  the largest one on record to be crafted by an amateur astronomer. While the primary mirror is 70 inches, the black metal structure itself stands about 35 feet tall, supporting a secondary mirror that is 29 inches. Clements bought the 900-pound mirror  which was originally destined to go into space as part of a spy satellite until the edge of it was chipped during its manufacture  after it was auctioned off. 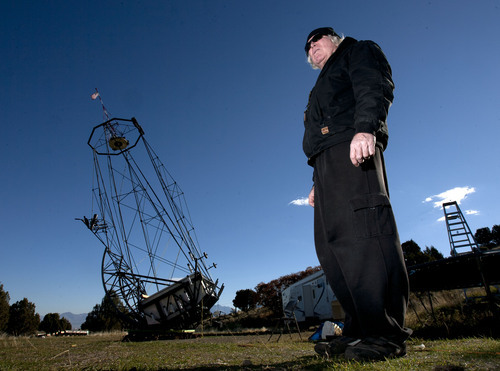 He picked it up in 2005, knowing it would help him fulfill his dream of building a huge telescope. Many people told him the shape wouldn&apos;t work, and that it would distort the view, but he said he couldn&apos;t pass it up. "I&apos;ve been interested in telescopes my whole life. I&apos;ve always had bad vision, and telescopes have been almost like a prosthesis for me. I&apos;ve always been obsessed with astronomy and planets and building things. People told me there&apos;s a limit you reach and then the pros have to do it, and people told me this mirror would never work, but I just had to have that mirror," said the 51-year-old, whose excitement over the project is barely contained in his breathless, pauseless sentences. It&apos;s hard to imagine him alone in truck for 8 to 9 hours a day, six days a week, driving 2,000 miles for Central Refrigerated Service, Inc., with no one to share his thoughts. But, he says the silence gives him time to dream up the design for telescopes. In fact, he never actually drew up plans for his monstrous telescope  he just adapted the design from smaller telescopes in his mind. His longtime friend Steve Dodds, who owns Nova Optical, helped him test the focal distance of the mirror. He found that in order to make the mirror focus the image, the eyepiece would have to be a whopping 427 inches away, hence a structure more than 35 feet tall. Dodds also provided Clements with some space to build the telescope on his 5 acres of land in Herriman that he&apos;s dubbed Astronomy Acres. "My involvement has been real slight. I come out and help him and hold something once in a while, but this has been all Mike," Dodds said. "I had my doubts it would work, especially with no plans being drawn up, but I have to admit, it&apos;s working." Clements knew the challenges, but he said he couldn&apos;t let the dream go despite the "huge chance of failure"  he gave himself a 1 in 20 chance of success. He won&apos;t say how much money he&apos;s invested in the telescope already, but he&apos;s put any extra income into the project  which he says he&apos;s dreamed about for 15 years and has built for the last 18 months. He found ways to cut costs everywhere he could  buying a trailer hitch and dumbbell weights to counterbalance the huge structure and working with Triple-S Steel for the metal and Metal Line Fabrication for the bearings. One of the riskiest parts of the project was turning the huge 70-inch piece of glass into a mirror by applying the silvering himself. But with the guidance of Angel Gilding, he was successful on his second attempt, he said. When he first looked through it at the moon, he feared that his detractors were correct and that he had failed. "I just saw this horribly warped shape, but then I realized I was zoomed all the way in on a crater," he said. "This has just overwhelmed all my expectations." The telescope has no gears, and must be hand-directed to look at celestial objects. He also plans to "take it to the people." Clements owns land in Delta and initially thought he&apos;d build the telescope there, but he was "thrilled" with the thought of having it in Herriman because more people would have access to it. "As soon as I told people what I wanted to do, they got all into it, and I realized that this thing needed to be portable," Clements said. The towering structure breaks down somewhat and could be hauled in a trailer and reassembled with a small, portable crane Clements made to build the telescope initially. He simply needs to raise the money for the trailer. A group of amateur astronomers visited the telescope Sunday night. While a high, thin covering of clouds didn&apos;t allow them to view the stars, they were impressed with the size of the project and the dedication of the man. "I was agog," said Patrick Wiggins, NASA/JPL solar system ambassador to Utah. "It&apos;s inspiring that someone with very modest means could put that together. It shows they&apos;re very dedicated or a little loony or a bit of both." Joking aside, Wiggins said the passion that Clements has for astronomy is infectious. 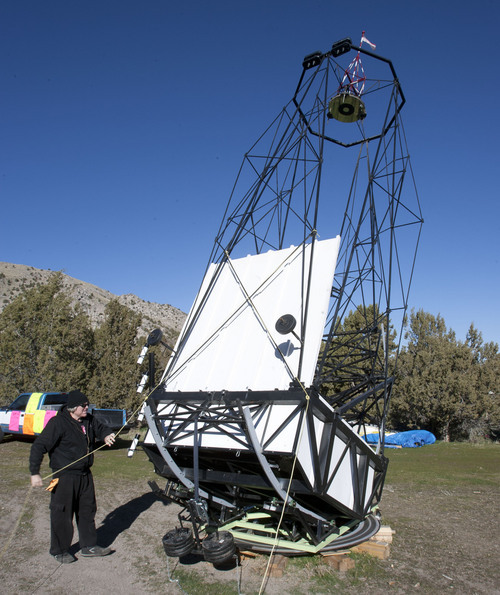 Clements already is talking about finding a way to get the telescope  which Clements has named KH-12 after the series of spy satellites the mirror would have been part of  out to the Stansbury Park Observatory Complex for a star party, and take the telescope on a tour of the national parks to reach as many people as possible. "This isn&apos;t about me. This is about passion and about pursuing your dreams," he said. "Everyone has their own personal telescope  maybe it&apos;s making an amazing wedding dress for your daughter. So you learn to sew and you make that dress. You don&apos;t have to be a fancy person. Anyone can achieve their dreams."